The simplicity of this method belies its benefit. First, it shortens, gladdens, and improves the act of marking papers. Because the teacher responds to a surface mistake only with a check in the margin, attention can be maintained on more substantial problems. The method perhaps goes a long way toward diminishing the halo effect of surface mistakes on evaluation, since much of this negative influence may arise from the irritation that comes from correcting and explaining common errors (its and it’s!) over and over. On the second reading the teacher does not lose the time gained initially, for according to my count students with correct on their own sixty to seventy percent of their errors (Lisman reports her “least capable students” are able to find sixty percent of their errors). Conservatively, I would say that this method saves me about four minutes a paper. That is nearly two hours saved with a set of twenty-five essays. Second, the method forces students to act in a number of ways that have current pedagogic sanction. In reducing the amount of teacher comment on the page, it helps to avoid the mental dazzle of information overload. It shows the student that the teacher initially assumed that carelessness and not stupidity was the source of the error. It forces the student, not the teacher, to answer the question. It challenges the students with a puzzle (where is the mistake in this line?) and reinforces learning with a high rate of successful solutions. It engages students in an activity that comes much nearer to the very activity they need to learn, namely editing—not the abstract understanding of a mistake someone else has discovered, but the detection and correction of errors on one’s own. Finally, improvement is self-motivated. The fewer mistakes students submit originally, the sooner they leave other students still struggling in the classroom with checks by every third line. Progress during the semester is also easily seen, if not by checks on individual papers at least by totals in the gradebook shared with a student during conference. Haswell, Richard. 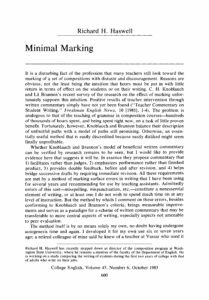 “Minimal Marking.” College English 45:6 (1983) 600-604. Copyright ©1983 by the National Council of Teachers of English. Reprinted with permission.